Fabulous Filipino & Filipina Celebrities in Hollywood – and Beyond! This is really entertaining! A true Pinoy or Pinay proud moment. There are many Filipino and Filipina celebrities out there in Hollywood. Many of them are of mixed-race parentage, thus, they don’t look Asian. My nephew, Mark de Vera, asked me recently if Vanessa Anne Hudgens (of “High School Musical” fame) would be showing up at this year’s Filipinas Magazine Achievement Awards on October 2, 2008 at the South San Francisco Conference Center. “Wishful thinking, Mark. You’ll never know!” I replied. Then, I thought to myself, “I didn’t even realize Vanessa is a Filipina!” Duh! Whether these Asian celebrities have decided to claim ownership to their Filipino-and-other-Asian-ancestry family roots or not, it’s nice to know that some of them, such as Cheryl Burke, Sharon Leal, Apl. de Ap. of Black-Eyed Peas, Tia Carrere, Mark Dacoscos, Lou Diamond Phillips, Dante Basco, Enrique Iglesias and his older brother, Julio Iglesias, Jr., and Rob Schneider are doing very well in their careers as performing arts professionals. Some of our successful celebrities make it their business to showcase Pinoy humor in mainstream America. A Bay Area comic, Rex Navarrete, makes a hilarious representative of Filipino American humor in the United States and overseas. His mom, Gloria “Goya” Navarrete, who is a nuturing friend and amazing gourmet chef, is one of Rex’s favorite subjects for his original comedies. Here are some of these Pinoy and Pinay Proud Moments for your entertainment. Our conversation also touched upon some “whistle blowers” regarding Formula Milk made by Wyeth that is supposed to be recalled in the Philippines. I got the impression from my chat with Nona that birth statistics regarding the contaminated milk have not yet been disclosed, especially the inference about the increased percentage of new-born infants who contracted meningitis. This definitely needs more investigative work — so whoever reads this and is interested can certainly contact Nona. Here is the “Formula for Disaster” documentary, courtesy of UNICEF-PHILIPPINES through YouTube.com. I swear that my next trip to Manila will include a visit to some of the places that my sister, Noemi Dado, lists and reviews in her Food Photo Blog and Events Diary, Pinoy Food and Other Cuisine. Noemi, as a new media publisher, gets invited to some of the new product review events and restaurant openings that PR companies in the Philippines conduct regularly. As always, my sister discloses how she gets invited to such events. Being invited to an event doesn’t mean that Noemi gushes superlatives about a product or a new dining venue. This talented Filipina offers insightful analysis based on her technical as well as business knowledge and experience. After all, Noemi has a B.S. Food Technology degree from the University of the Philippines. Some people still remember that she had an exciting career at the Institute for Small Scale Industries . I clearly remember this because she sub-contracted my services to interview some small business owners in diverse industries in Cebu. Thus, I was able to get an innate understanding about how a foundry conducts business or how a fledgling dried mangoes business emerged as a market leader. Even our own family bakeshop’s triumphs and woes became a case study for my sister at a national business publication. Noemi and I are FOODIES, that is, we share a love of interesting, oftentimes off-the-beaten-path type of cuisine. What Noemi’s blog offers to me is a current review of the trends happening in the Manila dining scene as well as the pop culture favorites of Filipino food consumers. I’ve noticed that her daughter, Lauren Dado, who is now taking her Masters in Creative Writing at the University of the Philippines, is an active contributor to this blog. Butch Dado, Noemi’s “Warrior Lawyer” husband, also loves to cook. Marielle, my other niece, has definite opinions about where and what she eats. She reminds me of her mom (Noemi). Here are some postings in Noemi’s blog that I found which appealed to me. Noemi talks about Milk Tea, which is a staple in Asian grocery stores here in the United States. I was first introduced to milk tea by my KabariNews.com‘s marketing director, Vonny Oei, a couple of years ago. How wonderful to see it being marketed as a coffee alternative in the Philippines! 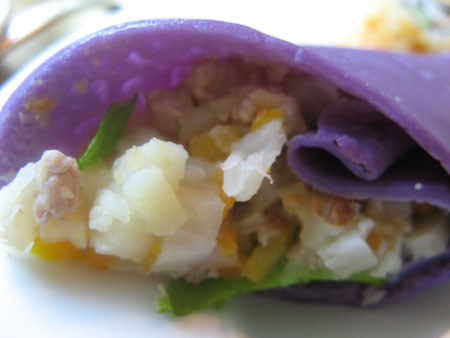 Her entry about Ube Wrapped Lumpia reminds me that there are many creative vegetarian dishes that can be included in a calorific, cholesterol-rich Filipino menu.